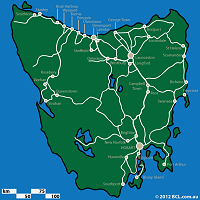 Tasmania is an island state about 250 kilometres (150 miles) south of the state of Victoria, across Bass Strait. It is approximately 68,000 sq Km ( approximately the size of Ireland) in area and is the smallest state of the Commonwealth of Australia. The capital, Hobart, is in the south of the island at latitude 42.5 degrees south. Maximum temperatures in winter average 12 degrees C, and in summer average 21.5 degrees C. The mild temperate climate make the summer months ideal for outdoor activity. Tasmania operates under Australian Eastern Standard time and applies daylight saving in summer. Hobart is on the Derwent River, has one of the world's finest deep water harbours and the majestic Mt Wellington in the background. The population of the Hobart metropolitan area is 194,000. One of the most popular ways to see the Tasmania is to hire a car and drive yourself. In the west, there are extended treks to explore parts of the remaining Tasmanian wilderness. What's On Events and things to do including cinemas, theatres, museums and historic attractions, general attractions and festivals around Tasmania. Keep up with the latest news & current affairs and political and lobby groups in Tasmania.